In December 2012, Scenic Hudson protected 68 acres that safeguard iconic views and enable public access to a secluded stretch of the Hudson. Bronck Island features grasslands, 250 feet of sandy beach and wetlands. Robert Rodriguez, Jr.
Acquisition of nine Hudson Riverfront acres on Bronck Island and a conservation easement on 59 upland acres—combined with a trail easement across the latter lands—will enable public access to this pastoral, secluded stretch of the river. 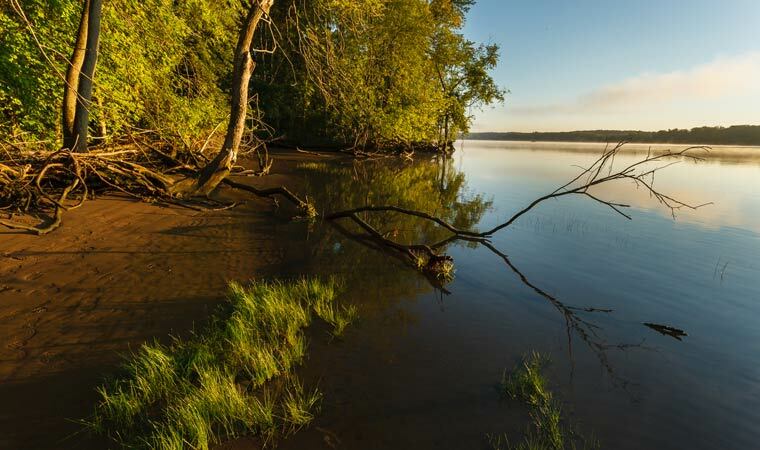 The land on Bronck Island (which is connected to the Greene County shoreline) features grasslands, 250 feet of sandy beach and wetlands; the protected uplands contain meadows, 40 acres of hardwood forest and dramatic ravines. Located within the Greene-Columbia North Scenic Area of Statewide Significance, the property is prominently visible from several popular riverfront parks in Columbia County. In addition, it provides habitat for myriad wildflowers (including the rare Asiatic dayflower) as well as bald eagles. The land on Bronck Island is adjacent to 25 acres originally conserved by Scenic Hudson and later transferred to the Hudson River Water Trail Association, which maintains a water-access-only campsite on the property. The acquisition is part of Scenic Hudson’s collaborative campaign to Save the Land That Matters Most, conserving properties of the greatest scenic, ecological and agricultural significance.